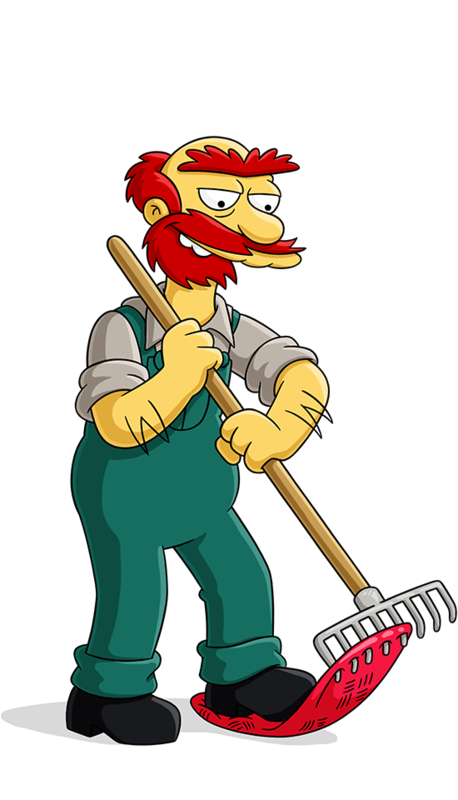 Scotsman in charge of Springfield Elementary maintenance. Solves most problems with his 12 bore shotgun. His hobby is body-building. Says: "Ach, yer pesky wee vermin!" Scottish, with a muscular; bodybuilder physique, red and shaggy hair, and even shaggier eyebrows. Tis more dizzying than the belfry at St. Corgegluynwaagen's. Scurry, me beasties, nibble and gnaw at their overstuffed buttocks! Scotland! Twelve hundred years, and we've only written one song!